Just as the summer ends and the flowers are finishing and the insects are dying off or creeping into hibernation shelters, something special happens in some of our Worcestershire meadows. There are usually not many people around to witness the event. Most recorders are indoors writing up their notes or with their heads over their microscopes. There are a few mycologists around, but they seem to be an endangered species nowadays, and those who are still active usually head for the autumn woods. In years when there is a lot of rain in late summer and autumn, some meadows might produce a most colourful and diverse range of fungal fruiting heads, a colourful tapestry to delight both artists and scientists! Unimproved grasslands may support a complicated and interwoven underground network of diverse fungal mycelia. These inter-relationships will have developed over many years, but they are vulnerable because they can be destroyed by ploughing, by the addition of fertilisers or if the grassland becomes rank and scrubbed over. Old pastures, churchyards or old lawns where the turf is kept short might all be suitable habitats. Photo © Rosemary Winnall Pink waxcap Hygrocybe caylptriformis. The group of fungi that is often represented in these low nutrient grasslands, especially if they are well-drained and with low availability of nitrogen, are the Waxcaps or Hygrocybes. Most of these toadstools are conspicuous by their bright colours – yellows, reds, oranges, pinks, maroons, mauves, greys, violets, whites, browns and greens. Features to note in the field include whether the cap and stipe are slimy, oily, moist or dry. Some have special smells and may smell of honey, pencil-sharpenings, garlic, raw potatoes or a nitrous scent. One is identified because of a most bitter taste when the cap is touched by your tongue. Others might go black or red when damaged or old. Hygrocybes are declining across Europe due to habitat degradation or loss. Worcestershire still has a good number of unimproved meadows compared to other counties in England and may prove to be a hotspot for waxcaps. There are about 44 Hygrocybe species in Britain, and a most useful identification book has been produced by David Boertmann (1996). Thankfully, he has grouped some species together and this makes the identification a bit easier. They are not all simple to tell apart, and there is some variation within species. The fruiting heads also change as they age, or according to local conditions and it is important to gain familiarity with a species during all stages of its fruiting. 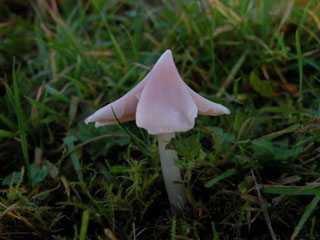 Only two waxcap species are mentioned in the UK Biodiversity Action Plan – the Pink Waxcap Hygrocybe caylptriformis and the Date-coloured Waxcap Hygrocybe spadicea. These are both mentioned in the Worcestershire BAP, although the latter has not apparently been seen in the county since 1950. Long-term monitoring of a site is necessary to provide a record of species present and to gain information about their status. Good waxcap grasslands are invariably rich in other groups of fungi, especially Fairy Clubs (Clavariaceae), Earth Tongues (Geoglossaceae), Entelomas and Dermolomas. These can add extra interest as they appear. 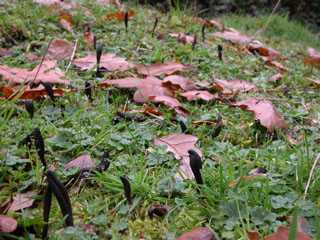 The Fairy Clubs and Earth Tongues are conspicuous by their odd shapes or bright colours and these spindles may be bright yellow, orange, pink, purple, white, black or green. The Entolomas and Dermolomas are not easy to identify and easy keys are still required for the field mycologist. At a good site 17 species or more Hygrocybes will be found on a single visit. It is said that over 20 species for a site will make it of national importance. A CHEG scoring system has been devised for these grasslands, in an attempt to determine the quality of sites and for comparative assessment (Maurice Rotheroe 2001. McHugh et al 2001). C - Clavari & Clavulinopsis, H - Hygrocybe & Dermoloms, E - Entoloma & Trichopilus, G - Geoglossum, Microglossum, Trichoglossum, Spathularia grassland. During this excellent 2004 fungi season, I have continued my search for good waxcap grasslands in the Wyre Forest area. These grasslands are not necessarily of special botanical importance, and can easily be overlooked by recorders visiting the site in the summer months. It is not always easy to predict if a site will have good waxcaps, although they appear to grow where there are quantities of the moss Rhytidiadelphus squarrosus. For some considerable time unimproved meadows have been recognised as important habitats for plants and invertebrates. But it is only in the last few years that grassland fungi and their ecology have been studied and their importance recognised, not just as part of meadow biodiversity but also in nutrient recycling. Waxcap fungi and their allies form attractive indicators of unimproved grasslands and we should identify the key sites within the county before they are lost. McHUGH R, MITCHEL D, WRIGHT M, & ANDERSON R, 2001. 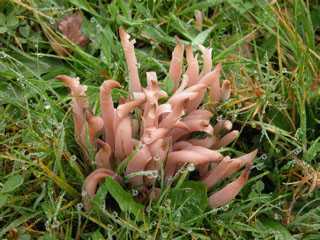 The fungi of Irish grasslands and their value for nature conservation. Biology and Environment: Proceedings of the Royal Irish Academy, 101B (3), 225-242.